Join WTS-LA for our first program of the year as we welcome newly elected LA County Supervisor Kathryn Barger. The LA County Board of Supervisors manages nearly $30 billion annually and is responsible for representing and overseeing services for roughly 10 million people. And, for the first time in history, four out of the five LA County Supervisors are women! 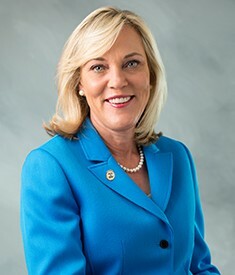 Supervisor Kathryn Barger serves the residents of Los Angeles County's 5th Supervisorial District - the county's largest - spanning 2800 square miles. In addition, Supervisor Barger serves on both the Metrolink and the LA Metro Board of Directors. Join us in welcoming Supervisor Barger as we learn more about her vision for mobility and the future of Los Angeles County. Cancellations must be made prior to Wednesday, January 25 at 5 PM in order to receive a full refund. For more information about this event or WTS-LA, visit our website.